One of the most beloved superheroes today is Batman. Over the past 50 years, the character of Batman has been brought to life by numerous accomplished actors, each winning over a new generation of fans. Perhaps because Batman is just a man and not really empowered with supernatural abilities, viewers and fans across the globe have embraced his tortured tale of revenge and redemption. At its heart, Batman’s story is about a young boy, Bruce Wayne, who saw his parents brutally murdered and vowed to bring their killer to justice, and to clean up the streets of his home city Gotham in the process. Viewers may be awed by all the fancy gadgetry and techno tools at Batman’s disposal, but what they really identify with is the very personal vendetta that compels him to seek justice. They also relate to his desire for secrecy in order to protect not only his own identity, but also those around him that could be put in jeopardy. There is a good reason that a man wears a mask when seeking vengeance and confronting diabolical criminals — it is to keep those he loves safe — and Bruce Wayne has already lost too much. 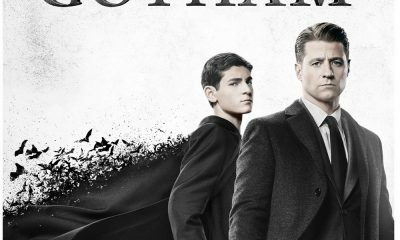 In Fox’s new drama series GOTHAM, it seeks to tell the dual tale of the pivotal years of Bruce Wayne’s life between the day his parents were murdered and the day he puts on the Batman mask, while a young police detective Jim Gordon (Ben McKenzie) seeks to find the Waynes’ killer. After all, Bruce was just a young boy at the time and those formative years were key in shaping the young man into the avenging hero that takes on those who unleash crime and evil in Gotham. In an exclusive interview, star David Mazouz talked about how his character Bruce copes with the loss of his parents and the people he turns to in order to find the inner strength to fight back and pursue his life-long journey for justice. 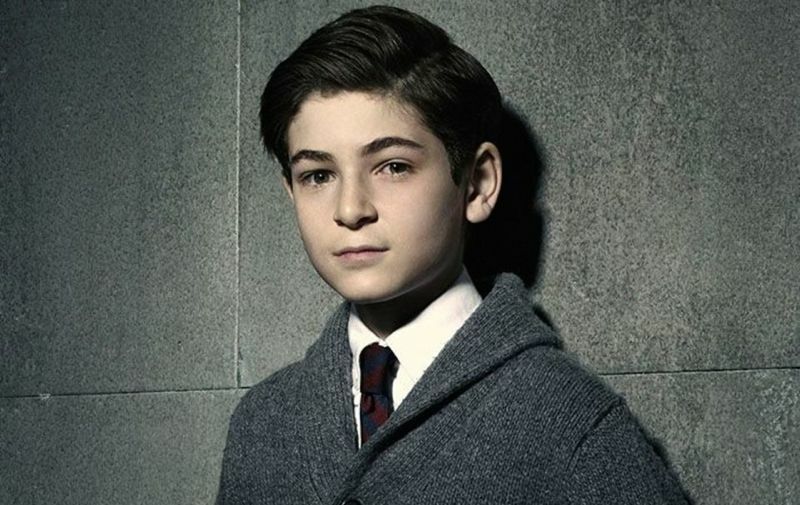 Now that you have filmed 9 episodes of GOTHAM, what can you say has surprised you the most working on the show? DAVID: Good question. Nothing has really surprised me so far. I really like the direction they are going with my character. As you’ve seen, in the pilot episode Bruce loses his parents and it is a traumatic thing that he is going through. It is kind of like post-traumatic stress disorder. At least for the first half of the season, he’s really dark. He doesn’t want to do much. He’s scared. He’s lonely. He’s looking for a friend. And you see as the show goes along that he starts to have an obsession — he starts to be compulsive. It’s really interesting, not just because it is an iconic role and the role of a lifetime — which is awesome — but also a really good, fun role to play. It’s definitely an interesting role. Can you talk a little bit more about Bruce’s post-traumatic stress disorder? DAVID: He’s having nightmares and he’s scared. Go back to when you were 12 years old and imagine you just lost your parents right in front of your eyes. It’s really a bad trauma. He’s going through the biggest tragedy of his life. Eventually he will turn that tragedy inside of him into strength to become the Caped Crusader that we all know and love. But, as for now, he’s just a really dark, scared person. Is Bruce seeing a therapist? What is he doing to treat his post-traumatic stress? DAVID: The Waynes do not believe in therapy and that is the way Alfred is raising him. Alfred — played by Sean Pertwee, brilliantly — he respects what the Waynes’ think and I think that is really interesting dynamic. That is really where Gordon and Alfred come in. That is one of the main struggles that Gordon has with Alfred. Alfred is not Bruce’s father, but he is raising him. Yet Gordon has some influence on Bruce as he is growing up too. So one of the main struggles between Alfred and Gordon is going to be that Alfred wants to respect the Waynes’ wishes and do things the Wayne way. He wants Bruce to work it out by himself. Yet Gordon really wants Bruce to do things the regular way and get professional help. So you will see that play out on the show. Which way do you think Bruce is leaning? Does he have his own inclinations on how he would like to deal with his situation? DAVID: He wants to do it the way his mother and father wanted, but Bruce really respects Gordon. As soon as they met, Gordon also shared that he had lost his parents at a really young age and, immediately, they had something in common. So Bruce respects him and looks up to him; and if Gordon says to do something, he will give it some thought and will pretty much do it because he respects Gordon and likes him as a person. Whereas, Alfred doesn’t think Bruce needs Gordon. He sees Gordon as a bad influence, in a way. Alfred still respects Gordon, but you will see some power struggle in there. So Bruce is kind of on the same page of Alfred; he wants to do things the way his parents would have done them. Sounds like Bruce has a tough road ahead and that it is going to be a hard season for him. DAVID: Yeah. But it will be fun. It’s really fun filming that. Have they allowed you to film any kind of action scenes, or are they keeping Bruce Wayne out of the big struggles right now? DAVID: There’s not too many, but you will see some. He gets into fights. He’s an angry kid. At least for the first season, he’s on the darker side. So you will see some more of that somewhere down the road. Do you find this kind of role really challenging for you because this may not be something you have had to portray before? DAVID: It is challenging, but I think that is what an actor’s job is. I think an actor’s job is to put yourself in someone else’s shoes and pretend you are them. So you have to ask yourself: what would they be feeling if this happens to them? What would they be feeling if that happens to them when this is happening to them also? It’s really fun. I enjoy it. 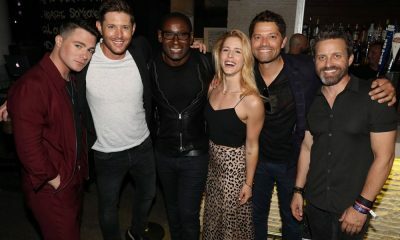 Since you are working closely with Sean Pertwee and Ben McKenzie, you probably you feel like you have to bring your A-game, and that has to be a lot of fun as an actor. DAVID: Sean and Ben are both really genuine, professional, great actors. In fact, they are people I look up to and look to as role models. Most of my scenes are with them and I really enjoy working with them. But the whole cast is fantastic. They are all fantastic people. Everybody is so great and perfectly cast for their role. I think the casting directors, along with Bruno [Heller] and Danny [Cannon], did just a fantastic job. It’s not just that they are perfect in their role, they are such nice people. Everyone is really great. 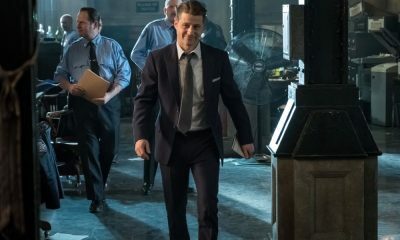 Have you had a chance to work with some of the actors and their characters on the show, or is your world primarily made up of scenes with Sean and Ben as Alfred and Jim Gordon? DAVID: Primarily with Alfred and Gordon. But you will see down the road that I’ll have scenes with some of the other characters. I just can’t wait to see Bruce in a scene with someone like Oswald (Robin Lord Taylor). I keep thinking: that’s going to be tense. DAVID: Yeah, that would be fun. As of right now, we haven’t had any scenes together. But Robin is a fantastic actor. He’s brilliantly scary and creepy. I could go on and on about Robin. He’s great. Like the sweetest guy. You’d never get that from seeing him on the show ’cause he’s so good. He’s a great actor. I think it would be really interesting to see Bruce and Oswald bumping into each other on the street. What about Selina? She was last seen hovering outside of the Wayne mansion. Are Bruce and Selina going to be crossing paths soon? DAVID: Not so soon, but they will be crossing paths this season and they will have a very interesting relationship. I don’t want to tell you too much because it might spoil it since it doesn’t happen for a while. But they cross paths, for sure. Since they are closer in age and because Selina’s story seems linked to Bruce’s since she was in the alley when his parents died — they are forever linked by this powerful event in his life — I would be curious to see what their first meeting is like and where that goes. DAVID: She is a witness to the murder. I mean, we really don’t know for sure, but she might have seen who the killer was. So if she ever comes clean about that, that will be huge. They are linked in a lot of different ways and it will be very interesting how and when they do meet, how all those ways that they are linked will play out. It’s really fun. It’s fun doing scenes with her. She’s a really great actress and a really great person. How would you describe your character in two words on the show? There’s a lot of promise in both those words. Good choices. So what can you tease that fans can look forward to this season for Bruce? DAVID: In the first few episodes, Bruce is more depressed and he doesn’t get out much. But you’ll see him get into fights. You’ll see him meet new people. You’ll see him do fun things with Alfred. I don’t want to spoil too much, but you’ll see him do a lot. Are we going to see Bruce checking up on how the search for his parents’ killer is going or is he going to leave that alone for now? DAVID: Of course, he is going to want to pursue it. Jim Gordon made a promise to him that he will find Bruce’s parents’ killer and he will be waiting for the result of that promise. That is the one case that will play out throughout the season, and maybe the whole show. 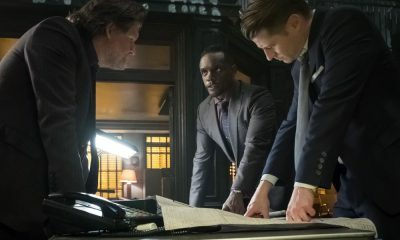 To also see how all those iconic villains and their terrible misdeeds shape Bruce into the hero we know to be Batman, be sure to tune in for all new episodes of GOTHAM on Monday nights at 8:00 p.m. on Fox. And remember: that which does not kill us, only makes us stronger.